Blackjack rules for Double Attack Blackjack give you the opportunity to double your bet if you feel that the dealer has a weak up card. A Spanish Deck is used which has 48 cards instead of the usual 52. The four 10’s are removed. Ace through 9 and J, Q, K are all in play. Eight 48 card decks are normally used. Insurance pays 5/2 but blackjack pays even money instead of the usual 3/2. Split – any pair. Players must place an equal amount for both the initial and double attack wagers. Split aces are dealt one card. Surrender – When the dealer does not have a blackjack players can surrender ½ of their wager(s) including after hitting, splitting or doubling down. 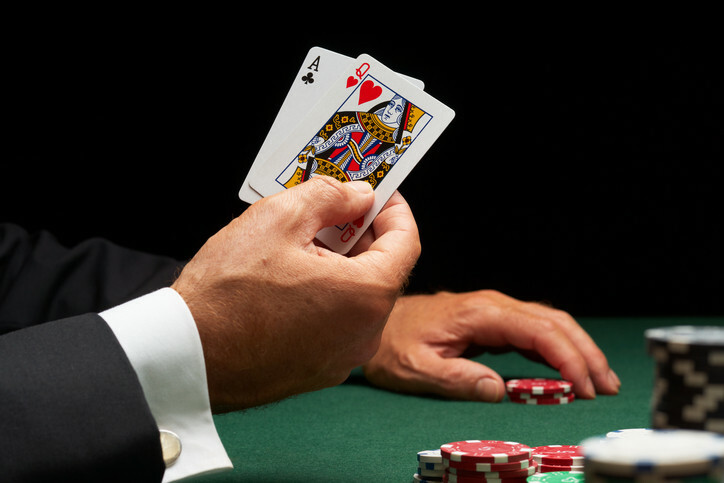 According to simple basic BJ strategy, if a dealer’s up-card is 2 or 3; he or she is considered neutral; 4, 5 or 6 up is a potential weak hand and a 7 through ace indicates a possible strong hand. If you are going to double attack, make your minimum wage when a 2 or 3 is showing, your maximum when a 4, 5 or 6 is up and do not attack a dealer hand displaying a 7 through ace. Remember you do not have any cards at this time. The insurance payout of 5/2 (for the few players that choose this option) is more than double the standard 2/1 however when taking insurance you are betting that the dealer has a blackjack, and with 32 10’s removed from an eight deck game, the dealer could have fewer blackjacks. Doubling down is also less effective for the player in that there are fewer 10’s. Although the Bust It! Side bet can be made for as little as one dollar, keep in mind that in order for you to win, the dealer must first bust and then with only three cards. Books, games, and strategy cards about blackjack can be found on Amazon. Direct link from this page to purchase. Additional publications and videos about casino gaming and other products can also be found on Amazon. Click on the link(s) below to purchase.